Update- Oct 18,2018- El Yunque has NOT yet totally reopened after the hurricanes. It sustained a lot of damage to the trails and roads. It is being worked on and we will post when they reopen more. Currently RT 191 is open only up until Yukahu Tower. Angelito Trail is open on RT 988, and El Toro trail is open on Rt 186.This tour is not available. The El Yunque National Forest is a large, lush and interesting place to visit. 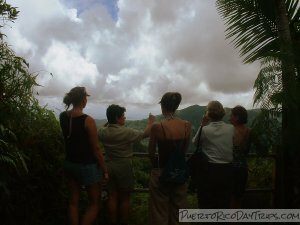 It easy to see the beauty, but to really know about the rain forest, an educational guided tour is great. 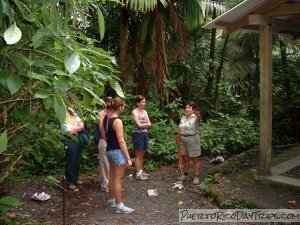 The Federal Forest Rangers offers “Thematic Interpretive Talks”, that are hour-long educational walks designed to teach you about the El Yunque rain forest. We have been to the rain forest dozens of times and have hiked many trails. We thought we knew a lot about the forest, but wanted to see what this program was all about. We stopped in at the Palo Colorado Station a little before 10:30 one morning and asked about the program. The tour was just about to start, so we bought our tickets. We were joined by 3 other people and our guide, Cynthia. We started the tour at the entrance to El Caimitillo Trail and continued along the trail for a total of about a half mile. The talks/walks start at El Portal Visitors Center. The guides pick a subject and they talk about it and other forest things along that theme. Our guide talked about flora and fuana of El Yuqnue. She was able to find all sorts of little flowers and creatures that everyone else would have just walked by and never noticed, such as the walking stick insects and tiny blooming orchids. We stopped often and she discussed things like the different levels of the forest and what trees can grow at each level and why. She told us about the rain forest mountains and why the location of El Yunque helps it get so much rain (about 200 inches a year). She discussed many interesting, lesser known things about the forest. It was a very relaxed, enjoyable hour of learning, that will make you appreciate the forest more and make you want to slow down and look around to really see the forest and its critters. We learned a number of new things and our Ranger told us about a lesser used trail we didn’t know about (that is an adventure for another day!). I highly recommend this tour. 6/18 Talks and guided tours have not restarted yet. The tour is open to everyone, people of all ages and activity levels will be able to enjoy this activity. However, the tours are on trails, it is not wheelchair accessible. And though most of the trail is mostly paved, the pavement is narrow and can be slippery. The tours are Mondays and Tuesdays at El Portal at: 9:30 a.m./11:00 a.m./ 1:00 p.m. There is a fee to get into El Portal- $4 for people 16 and over. $2 for seniors 65 years and older. Talks are free. The talk/tour takes about 1 hour. They are available in English or Spanish, language preference selected by the group. They also have other tours for school groups or large groups, but these tours must be scheduled at least 2 weeks ahead of time. Call for more info. El Portal Visitors center is located at Km 4 on PR Road 191. We took the tour with Cynthia today and she was wonderful! Her tremendous respect for the ecosystem was evident in everything she did. She took us on the Caimitillo Trail. It was a great experience as she pointed out flora and fauna, as well as small animals that we never would have noticed. We both learned so much on this tour! Thanks, Cynthia!